As promised previously, here's the fourth review in the Revomaze series, available from Revomaze and also in limited numbers from PuzzleMaster. The last few of these puzzles are currently being made, and it's unknown whether more will be made of the Silver puzzle, so if you want one, get it now! I've already covered the basic puzzle in my first review of the blue, so for general information on the Revomaze puzzles, I'd suggest reading that post here. The fourth puzzle from Revomaze is the Silver. This puzzle, like the Bronze isn't available as a plastic puzzle, as it's not possible to create some of the internals in plastic. 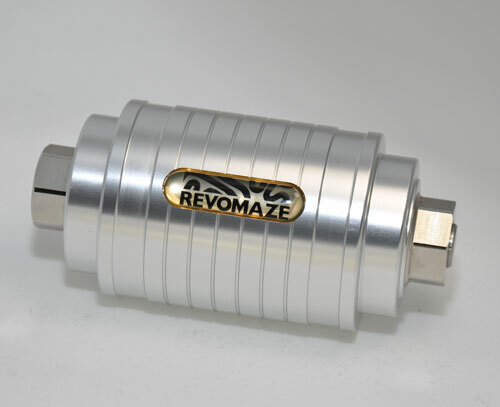 The Silver is rated by Revomaze as having a difficulty of 90/100 (extreme) and an estimated opening time of 160 hours. (Yes, 160 is correct, it's not a typo!) It is described as a dynamic maze and is the hardest puzzle to be released to date from Revomaze. This is a big jump up from the Blue and Green puzzles, and is a big learning curve from even the Bronze. While the Bronze puzzle had a trap that you couldn't get out of very early in the puzzle, Silver seems even worse. When you start, there is a tiny 'L' shape you can explore, one trap and nothing else. It seems that Chris has this puzzle locked up tight. The new elements added to Silver are numerous, and understanding each of them takes time. New in the Silver is the added difficulty that how you orient the puzzle while solving it affects things in the maze. Worse than this is that the SWAMP awaits you once you cross the not-a-canyon, and it's even stranger. The spinning canyon is the easy bit! Once in the SWAMP, you'll find walls appearing and disappearing and no obvious way out. It's time to put the thinking caps on, and figure out what could be going on to cause the strangeness you're experiencing. Only when you truly understand it will you be rewarded with progress. There be crocs in there! Having eventually found your way out of the SWAMP, you'll see that glorious dot on the shaft. You've made it. Your hands are shaking at this point, and you're excited. Wait, no, what the? The dot stops a centimetre from lining up with the dot on the sleeve. What could Chris have possibly done to leave you so close yet so far from the end? The final twist to the Silver really shows you just how cleverly built these puzzles are, and just how evil Chris is. It took me around 150 hours to open the Silver. It's an amazingly tough puzzle, but when you finally open it, and see the beauty of that maze inside, it's all worth it. Not to mention that you can stop swearing at Chris and his ingenious mechanisms. I'm asked fairly frequently whether you need to have solved one of the other puzzles in the series before opening Silver. The only answer I can give is that no-one so far has opened Silver without having previously opened another puzzle. With only approximately 36 Silver puzzles opened since their launch in October 2009 it's not an easy puzzle, and truly deserves its name as one of the most difficult puzzles in the world. You may remember me mentioning back in the first post in the series of reviews that the puzzle was pretty tough and hard to break. Well Silver when initially released had a small problem. Something inside didn't quite work the way it was supposed to, and as a result a number of the original Silvers were un-openable. When Chris realised the issue, he sent all the people who had a V1 a free replacement for their puzzles. So V2 was issued which had a couple of small tweaks inside to fix the issues, and ensure they worked the way they were intended. Now that's what you call good Customer Service. All Silver's sold now are V2, and although they no longer have the double dot on the sleeve to confirm they are V2, it's safe to say that when you buy one it will be the V2. The V1's are with their original owners in most cases, or still with Chris in a few. The one word of warning I'll give is that if you do decide to buy one, and I highly recommend you do, this one will take its toll on your fingers and your sanity. You have been warned. This is a brilliant puzzle, but it's by no means easy. * If you want to know who Allard is and why he Thinks a lot, then join the Revomaze forum! Great review Neil! To all thinking about going straight for the silver – DON’T do it! You will just end up with a very expensive paperweight or a hole in the wall. Start with an easier one – even the bronze is a hell of a challenge if that is your first.